It seems that this is caused by the keyboard and mouse having a Power Management setting “Allow this device to wake up this computer“. 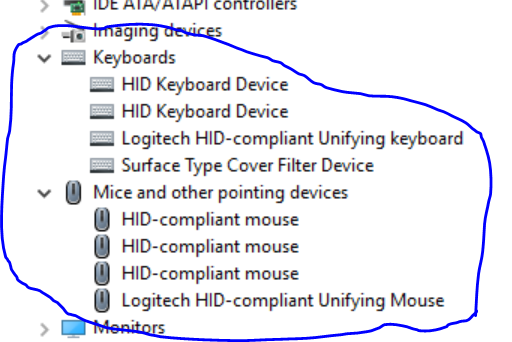 Why would you have this option for these peripherals especially with a Surface Pro for example when the keyboard and mouse is a little flexible and can easily be knocked and activated in a bag. I must say that this has worked for me and solved my issue of the random wake ups in the bag on more than one occasion. Also too, I have noticed that on some occurrences Microsoft would release an update and as a result it would set these devices back to their default settings. So here are the devices in question: Right click on the Start Button > click Device Manager. Only some keyboard and mouse peripherals shown here will allow for the option to wake up the computer. And here is one of the properties in question “Allow this device to wake up this computer“. To fix this – rather then going through each and every device, there’s an easy way, run two commands. Open command prompt – click start > type in ‘cmd‘ > hit CTRL-SHIFT-ENTER > Yes if it prompts you…. In command prompt type in powercfg -devicequery wake_armed to find devices which are set to wake the computer. The simply type in powercfg -devicedisablewake “<device_name>” to disable the devices listed one-by-one.